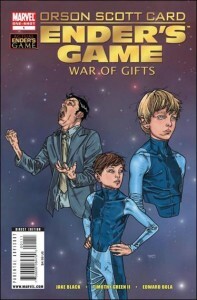 Ender Wiggin may be in space learning to fight Formics, but his older siblings Peter and Valentine are saving the world back on Earth. 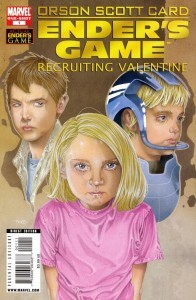 When Valentine learns of an injustice in her school, she wants to fight it. Enter Peter who guides his sister through the process of nonviolent influence, and sets the ball rolling for his plans to one day rule the world. 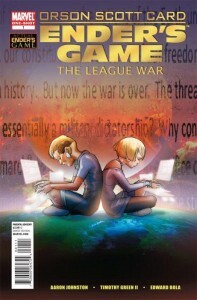 Jake Black, writer of the upcoming Ender’s Game Companion, adds this all-new never before told story to the Ender’s Universe. In this one-shot prequel to the award-winning novel Ender’s Game, Mazer Rackham, the only man ever to defeat the Formics, takes on a new enemy…the International Fleet itself. Burdened with careerists and bureaucrats, the I.F. is doomed to fail in the coming war, and only Rackham, with the help a young Hyrum Graff, can rid the I.F. of its old guard and pave the way for Earth’s next great commander. 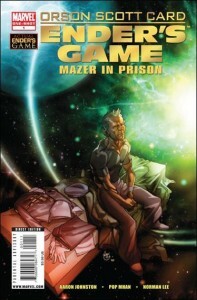 Adapted from Orson Scott Card’s short story, MAZER IN PRISON is a look into the beginnings of the system into which Ender Wiggin found himself thrust. Zeck Morgan was raised by his minister father to be a pious, God-fearing child, devoted to his church. Unfortunately, when the International Fleet decides Zeck is a candidate for training in Battle School, they tear him from his home and prepare him for war. Zeck refuses to participate in the school’s war-games due to his pacifist religious beliefs. When he sees another student celebrating Christmas–seemingly violating Battle School’s rules against religious practice–he raises an uproar that may tear Battle School apart. Can even Ender Wiggin calm this furor? 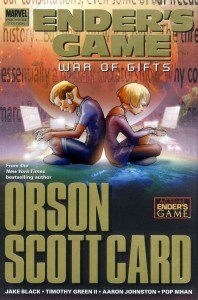 Find out in this double-sized adaptation of Orson Scott Card’s Ender Universe novella, War of Gifts.